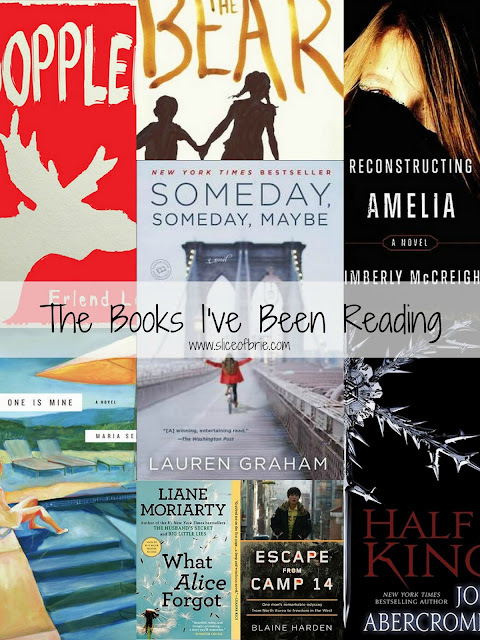 April was a fantastic month for reading - I read 6 books that month! I'm not sure I've ever read that many in one month before. And then May happened. What a crazy month May was - I went to New York, I ran a 10K and we made our final move to Calgary. Very little reading was accomplished - 2 whole books to be exact, but any book is better than zero books in my mind. Here's a short blurb on each of the 8 books I've read recently. Doppler by Erlend Loe: A crazy story about a man named Doppler who abandons his life to live in the woods with a moose calf. I didn't get this book. At all. Blame it on the mommy-brain, blame it on the blonde hair, I don't care, Doppler was a douche-bag and I couldn't see past his mid-life crisis and childish ways to see the humour in this one. The Bear by Claire Cameron: Written from a 6-year old's perspective, this is a harrowing story about two young kids who must fend for themselves in the woods after their parents are attacked and killed by a bear. An emotional read that will make you want to hug every 6 year old kid you see. Reconstructing Amelia by Kimberly McCreight: Told from alternating view points of (deceased) teenager Amelia, and her mother Kate, this is a story about everything that is wrong with social media, smart phones and teenagers of today. Suspenseful and even horrifying at times, this one kept me flipping pages well into the night. Half a King by Joe Abercrombie: A book club pick and not something I would normally pick-up on my own. About a one-handed, young prince named Yarvi, who has been wronged, and will survive just about anything to get revenge. The perfect amount of fantasy for me - not too long, not too much detail and not a bazillion characters. Escape From Camp 14 by Blaine Harden: The story of the one of the few people born in a Korean political prison who not only escaped, but survived to tell his story. Eye-opening, horrifying, and unbelievable at times, sometimes the truth is tough to stomach. Unfortunately, this read too much like a history lesson and less like a biography. What Alice Forgot by Liane Moriarty: Loved, loved, loved this book. Alice has come-to after hitting her head at the gym, and remembers nothing of the past 10 years. She's 29, not 39, has three kids and is getting a divorce. An utterly delightful read, both funny and insightful, Alice must piece together her lost years and decide what's truly important to her, and what's worth fighting for. This One is Mine by Maria Semple: The lesser known (first) novel by Maria Semple, author of Where'd You Go Bernadette. I wanted to love this one just as much as Bernadette, but I couldn't. It was dull, one-dimensional and full of characters I didn't like, and not in the "I love to hate you" kind of way, but in the "you're rich, utterly boring and a jackass" kind of way. Someday, Someday Maybe by Lauren Graham: The only book I read while in New York, which was fitting seeing as how this is the story of a young woman, trying to make it as an actress in NYC circa 1995. It was funny, witty, and just a pleasure to read. The throw back to living in a time where there were no cell-phones and no internet added a welcome dimension to the story. A must read for any Lauren Graham fan! Any good books lined up for the summer? What's been your best read lately? I'm always looking for new book recommendations! Good to know about the Maria Semple book- I too loved Bernadette, but will probably just wait to see what her next book is like (whenever that is). Yes, I will definitely read her next one - I'm very curious to see what it will be like and about. These two were SO different, both in writing style and topic.